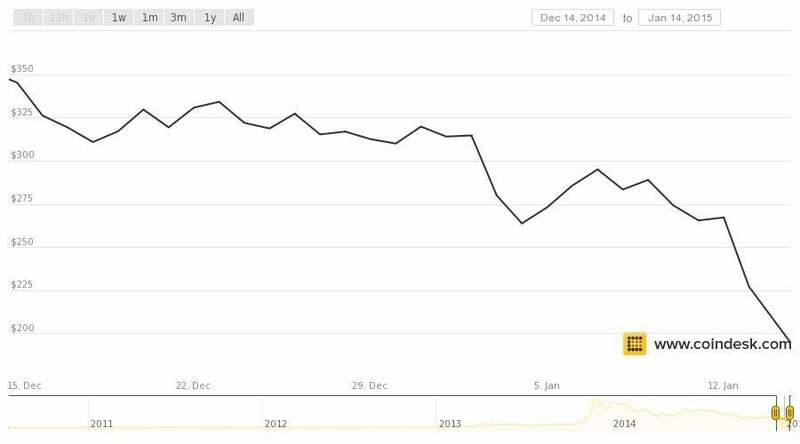 Bitcoin crashing: Even the ruble is a better investment. In December, when the ruble crisis was really revving up, a small number of panicked Russians appeared to start moving their money into bitcoin. Even though the cryptocurrency was technically banned in the country, the volume of ruble-denominated trades shot up 250 percent, CNBC reported. Bad call. While the ruble has had a wild ride lately, it’s down just 3 percent against the dollar over the past month. Bitcoin, meanwhile, is in the midst of an epic collapse, having lost 44 percent of its value since Dec. 14, according to Coindesk. Russia might be in the midst of the crisis, but its currency has still been a safer bet than everyone’s favorite online currency/speculative investment opportunity/digital fetish object for techno-liberterians. What, exactly, is causing the plunge? Earlier in January, some people were blaming short-sellers. But now, the consensus seems to be that bitcoin is, as Business Insider’s Rob Wile puts it, “stuck in a self-fulfilling downward spiral.” The problem has to do with bitcoin miners—companies whose computers unlock new batches of the currency by solving complicated math problems. Mining takes money—computing power and electricity aren’t free, you know—and because bitcoin’s price has fallen so low, it may no longer be profitable. So miners are now selling off bitcoins in order to cover their dollar costs. But the further bitcoin’s price falls, the more they need to sell in order to pay the bills. Now, with a real national currency, this might be the point at which a central bank swooped in to the rescue. Russia, for instance, has tried to prop up the ruble by buying it with dollars (I don’t think that’s a permanent solution, thanks to falling oil prices, but that’s neither here nor there for the moment). Bitcoin has a slightly different safety mechanism. Essentially, the network can make it easier to mine bitcoin, which should also bring down the cost of doing so. The problem is, as Coindesk notes, the adjustment doesn’t happen immediately. And the fewer people mining, the longer it will take. Meanwhile, once the difficulty level does drop, more miners could come back online. That should push the difficulty level up again and make mining unprofitable again. Wash, rinse, repeat. A lot of bitcoin’s fans like to argue that these day-to-day price movements aren’t particularly important, because the real appeal of the cryptocurrency is its underlying technology. But having people willing to mine bitcoin is essential to the entire system; it basically powers the giant online ledger that tracks bitcoin trades. If mining becomes financially unappealing, it would undermine the whole project. But we’re getting ahead of ourselves at the moment. Today’s main lesson is really just that some Russians apparently can’t catch a break.